Marisol Ortega is a designer, illustrator, maker originally from the west coast currently living in the Midwest with her husband, daughter and kitten. She is a multi-faceted designer, illustrator, pattern maker and letterer. Her fearless use of bright color ways, interesting texture and range of mediums make her work stand out from the rest! Was creativity part of your childhood? Were your parents in creative fields? Creativity was for sure a part of my childhood. I grew up in southern California until I was about 7 years old. I was the only girl in a 5 male group of cousins who was not interested in wrestling so by default I was always left to my own devices. I used to carry around a small pencil box filled with crayons, colored pencils, scissors and paper. I went everywhere with that pencil box. I literally have photos of me at family events where I am either somewhere in a corner coloring or on a table, away from the crowd, drawing. It’s always been my outlet. Although my parents were not in creative fields, my father and I shared a love for making things with our hands. He is a construction worker and has always worked with wood. He built me several easels throughout my childhood, it was pretty sweet. Well, I moved to Seattle in 2004 to attend The Art Institute of Seattle, I was a design intern for Tully’s Coffee Company in Seattle for about 6 months, while going to school. I really loved working in-house and it just so happened that a spot opened up at One Reel (the non-profit behind Bumbershoot Music Festival in Seattle) as a production artist. I applied and was offered the seasonal job. From there I went to Seattle Symphony Orchestra, also a non-profit. I kept working at non-profits for about 4.5 years until I moved onto for profit companies. I got most of my illustration experience from my design position at the symphony. My Art director, Iwona Konarski is an amazing designer with a love for everything letterpress. She let me explore a lot and really fostered that in me during my time there. We were also a small but mighty 2 lady team doing everything from concert booklets, posters, annual reports, season campaigns, street signs, way finding, packaging, invitation, you-name-it we did it. It was that multifaceted experience that lead me to the design position with Theo Chocolate and eventually a senior designer at Starbucks Coffee Company. What would be the biggest risk you have taken thus far in your career? I HAVE 2! I left a full time job with benefits for a 3 month contract with no benefits at Starbucks Coffee Company. My contract kept getting extended and eventually I was offered a full time job and a promotion. So, although that was super scary with a new tiny human I followed my gut instinct and knew I couldn’t pass up the opportunity. My second one would probably be leaving said job, packing up our little family and moving to the midwest. Describe your process and what you're working on now. No matter the medium, I always start out with a small sketch, mostly for composition purposes. I work in a range of styles of illustrations/design so most likely a good amount of research material before I start painting. All of my textures in my illustrations are done analog so I break up the work and identify what those styles/mediums are before I start. I work in black ink, pencil, acrylic gouache, watercolors and linocut. More often than not I combine at least 2-3 of these mediums. I’m pretty indecisive/like to have options so I compose my illustrations on the computer for the final plus… you never know when your client is going to be like, “we have some tweaks”. I’m currently working on an illustration campaign for a typeface designed by a Canadian foundry, a couple of Christmas collections for Hallmark, and just wrapped up a massive Sumatran tiger for a Starbucks in Missouri. Personally, I’m always trying to figure out how I can use more linocut into my work so I’m working on a slab serif with decorative floral elements, linocutting them and making prints. Another huge aspect of your work is linocut. What have you learned through this craft? I love, love, love anything linocut. I started doing it at Starbucks and incorporated my textures wherever I could. It’s so versatile, you can make textures, shapes to mask, an outline with an imperfect edge—so good! I love how bold and intricate it can be and so affordable. I have a couple of personal projects going around that. My most recent project with Lost Type— Lehigh was all done in linocuts. It’s one of my favorite projects to date. How often do you collaborate with other makers? Is this an important part of your process? Pretty often, actually! I’ve learned over time that collaboration is important and makes a greater impact than anything you can make on your own. Even in jobs where I was the only designer I was still collaborating with other departments. The collaborations I currently do as part of my freelance jobs is on another level. I have met and befriended the lovely designers/type designers of Lost Type and we collaborate on a variety of projects. They are some of my most rewarding projects I’ve had the honor to take part in because we are all on the same page and work really well together, and it all happens via the internet! Describe how the creative community in Kansas City differs from that of the West Coast. 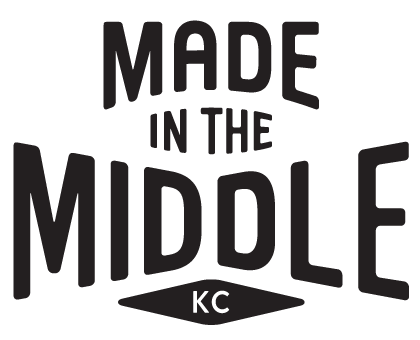 Kansas City has a big maker community and I really love that because everyone is nice enough to teach their trade or give tips/tricks and oh so humble too. Seattle had small pockets but I often felt it was a little exclusive and maybe like I was too young to be involved. If you could meet 1 person dead or alive that has inspired you, who would it be? Charley Harper. Everything about his work is amazing. I would love to talk to him about his textures, techniques, and compositions. You explore a lot with hand lettering, where did your interest in this come from? How would you describe your style of lettering? My interest initially started while I was working for Theo Chocolate. Their branding leaned on the whimsical side and I loved adding little hints of hand lettering to their packaging design. When I worked at Starbucks, a lot of the gift cards I illustrated/designed had hand lettering. As I started working on other projects from the studio I just gravitated towards created custom type solutions for packaging as well. My favorites were the Starbucks Reserve coffee labels, a perfect mix of illustration and type. More recently, I’ve been trying to refine my craft. I definitely have an imposter syndrome with it though, I still consider myself a novice at it. There’s just so much to learn! Would you consider yourself to be creatively satisfied? How can one find creative satisfaction? Oof. That’s a hard one to answer, but I would say no. I’m constantly looking for the next medium/technique to try. I always think I can do better and it makes me push the illustration/design to another level. I tend to sweat over the details and techniques but it gets me excited for the next project because I know I learned something new. You worked at Starbucks for over two years. What is the most valuable thing you learned while working on their creative campaigns? BRANDING. We had a lot of designers and each had a unique hand in the design of every product/sign but it all tied together, one brand. It always holds well in stores, across multiple channels and internationally as well. I learned that a lot of people in the studio dabbled in a lot of different things. We were hybrids and that’s part of the reason we all worked really well together. WHAT ARE you excited to work on in the next few years? I’VE STARTED THEM A LITTLE BIT, BUT LARGE SCALE PIECES. I’ve done a few for Starbucks but would love to do more of them! If you could moonlight as another profession, what would it be? BOTANIST. Hands down. I love flowers/plants. What's the last hobby you picked up? Embroidery. I took a workshop at Hallmark and have fallen in love with it. I’m currently trying to illustrate with it. I’ve had some ok results but I can’t wait to keep practicing. What's the best thing to happen to you this year? Living close to my mom again. It’s especially amazing because our daughter gets to know her grandparents, so sweet! What is your favorite season in Kansas City? Fall! I’ve never seen anything more beautiful than driving down Shawnee Mission Parkway towards the city. All the trees along the road changing color—ah, just beautiful. Illustrations and typography by Marisol Ortega. Bottom right, Lettering for Hallmark Cards Inc. The creative community is amazing. Everyone’s got each other’s backs, super humbled and everyone is welcoming in every group I’ve been involved in. It’s been really lovely as newbie. Let’s not forget how incredibly talented everyone is too. I love the range of creative people too. Oddly Correct and Maker Goods, both are a couple doors from each other on Main & Wesport Rd. I love coffee and when we moved to KC we tried every coffee shop in town to find the most delicious flat white and Oddly was it. Plus, all the baristas are super nice. I love Maker Goods because I have a pencil/pen addiction and I just can’t get enough of all the goodies that are so well curated and Felicia is the best!